Sardar Patel , the iron-man. Sardar Patel was the greatest administrator and the best statesman that India has even produced. Mr. Patel,widely known as an ironman ,was born in 1875. Karamsad was his native place, a village in Anand district in Gujrat. He was a simple boy coming from a farmer's family. At school, He was a naughty and mischievous boy in due course, He passed his matriculation examination and after some years he passed the law examination. He practiced as a lawyer at Godhara. He carried on a roaming legal practice. As he was ambitious, he went to England and became a barrister-at-law,in 1923, He became the leader of Baradoli Satyagraha. From then, he came to be known as Sardar Patel. His elder brother, Mr. Vitthalbhai Patel, was the president of the Indian legislative assembly. Mr. Patel was jailed several times in connection with the freedom movement. He was the right hand man of Mahatma Gandhi and his most trusted lieutenant. It was Patel who maintained discipline in the congress ranks. In 1936, the congress at the general election won the majority of seats in seven provinces of British India.Sardar Patel, as the most important member of the central parliamentary board, controlled with firm hand the congress ministries in the seven provinces. in 1947, india was partitioned into Pakistan and free India. 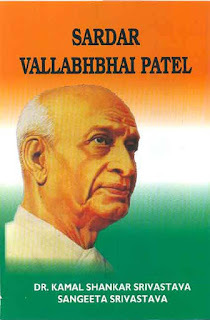 Sardar Patel became free India's first deputy prime minister, Pandit Jawaharlal Nehru being the first prime minister. He was in charge of the home department and administered law and order. Many people will marvel at his organizing capacity and superhuman ability. The integration of 600 princely states and the elimination of autocratic rule of the Maharajas and Nawab will ever stand out as his unique and greatest achievement. he did it without bloodshed and in the short span of two years.Was it not a miracle? to him rightly goes the credit of completely changing the map of India. tribal raiders and Pakistan troops attacked Kashmir and tried to secure accession by force. He saw the writing on the wall. The Indian armies landed in Kashmir by air.He was essentially a man of action. He was India’s man of destiny. He was the steel man of India. He was the brightest luminary on the home front. He was a walking volcano with fires racing in his heart. he was not a man to be ignored or trifled with. defeat he never knew, weakness he never felt and indiscipline he never tolerated. The iron man died on 15th December , 1950. Though India has got many freedom fighters but Sardar Patel was unique. Lots of sallute to this great man.